Carte De la Partie Inferieure de L'Inde en Deca du Gange Contenant L'Isle de Ceylan, Les Cotes de Malabar et de Coromandel, avec le Pays compris entre ces Cotes. 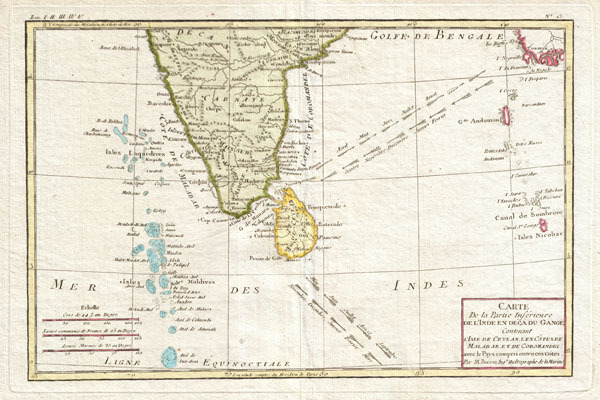 Attractive 1780 map of southern India by the French cartographer Rigobert Bonne. Covers from the Deccan plateau south as far as the Maldives and as far east as the Andaman and Nicobar Islands. Includes Ceylon or Sri Lanka. Shows the direction of the important Indian Ocean trade winds and their corresponding seasons. The regularity of the trade winds in the Indian Ocean generated active nautical trade routes well into antiquity. Published as plate no. L 3 in Bonne's 1780 Atlas de Toutes les Parties Connues du Globe Terrestre. Very good. Contemporary color. Seems to have a double impression in upper quadrants - see zoom. Original centerfold. Blank on verso. Wide clean margins. Pressmark visible.